Speaking about L’Oreal – the company actually showcased one of their existing beauty tech services at SXSW the other day. A couple of years ago, their Innovation Lab developed a dispenser using artificial intelligence to mix foundation specifically adapted to the user’s skin. What it does, is that it collects data from three points in the users face and this data is picked up by an algorithm that identifies the levels of cyan, magenta and yellow in the customer’s skin. The company actually debuted this tech exclusively at store chain Nordstrom in 2016, but according to Decoded Fashion it is still the most advanced innovation out there as of yet. And foundation shades continue to remain a hard nut to crack for consumers. Although many brands provide a much wider range of shades these days, it can still be tricky to find the absolute right shade for your individual skin tone. So I imagine that using data to come to terms with this might be worth quite a lot. The French cosmetics giant L’Oreal takes another step towards the digital beauty market. Today they announced that they’re buying Canadian beauty tech company ModiFace, Business of Fashion reports. ModiFace, with its almost 70 engineers, researchers and scientists employed, specializes in artificial intelligence. So far they have released several beauty apps for makeup tryout, real time video retouch and such. L’Oreal on their part, have been developing services like sensory brushes telling you how to care for your hair. So this is likely a perfect match. Feature from ModiFace Virtual Makeover app. There’s an ever present need to discuss how fashion and tech is going to make use of each other and evolve together in the future. Here are a few of the upcoming conferences not to miss this spring and early summer. First out is the brand new Swedish Beauty & Tech conference in Stockholm on April 25. The event is organized by the Swedish online tech mag Breakit that over the past year or so, have started to focus their interest more on the ever expanding fashion tech area. Their one day conference Beauty & Fashion Tech 2018 will be held on April 25 in Stockholm and includes speakers such as H&M:s new brand /Nyden, digital beauty service Dashl and digital fitting solution Virtusize among others. Copenhagen Fashion Summit on May 15-16, focuses on sustainability and innovation technologies in that area. Among the speakers are Stella McCartney, who is collaborating with spider silk company Bolt Threads. Fashion Tech Talks in Stockholm, is back for a second edition on June 5, again at Fotografiska in Stockholm. No speakers are confirmed at this point. Wear Conference 2018, New York City, June 11-13: features three days of presentations, workshops and sessions about wearables, featuring for instance Ivan Poupyrev from Google ATAP, Aldjia Begriche from biosensing garment brand OMSignal and dr Amanda Parkes from Future tech Labs. Wear It Festival in Berlin, June 19-20, is focusing on the potentials of wearables, development of new products, and creation of prototypes. Is virtual makeup try-on the future? Well, hopefully! The beauty- and tech industries have been approaching each other for a while. And it seems we’re only about to see more of that from now on. 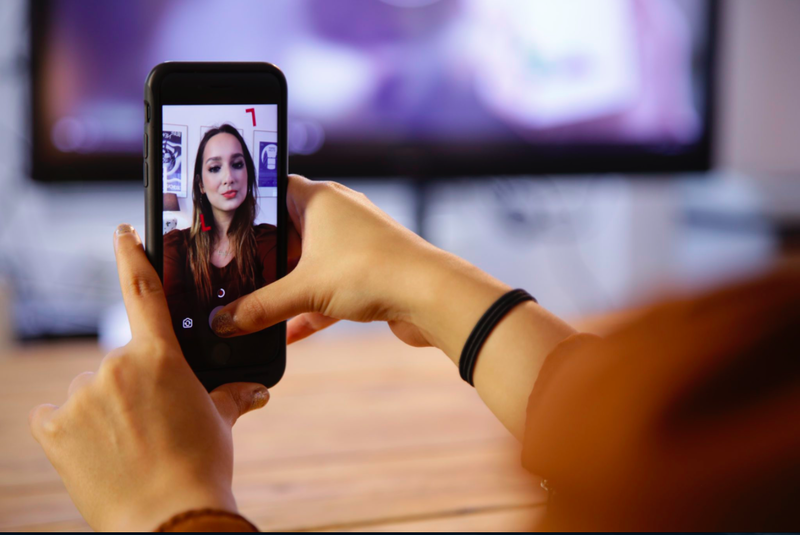 The latest news is Holition who has teamed up with Facebook and make up brand Rimmel creating a service using Facebook’s in-app camera to allow users to virtually try on Rimmel’s different make up looks and share with the world. I haven’t tried this myself yet but I’m a fan of the idea in principle, especially if it eventually leads to better online shopping decisions. For now it’s probably just a good way for Rimmel to create buzz around their brand.